Following the T410, the bigger T510 now faces our test course. Now Lenovo has also updated its 15 inch T-range classic with cutting-edge technology with the Arrandale CPUs. Our prototype additionally starts with a discrete Nvidia NVS 3100 graphic card and a 4 GB DDR3 RAM. Read here if the latest model can take it up with its forerunner's success. 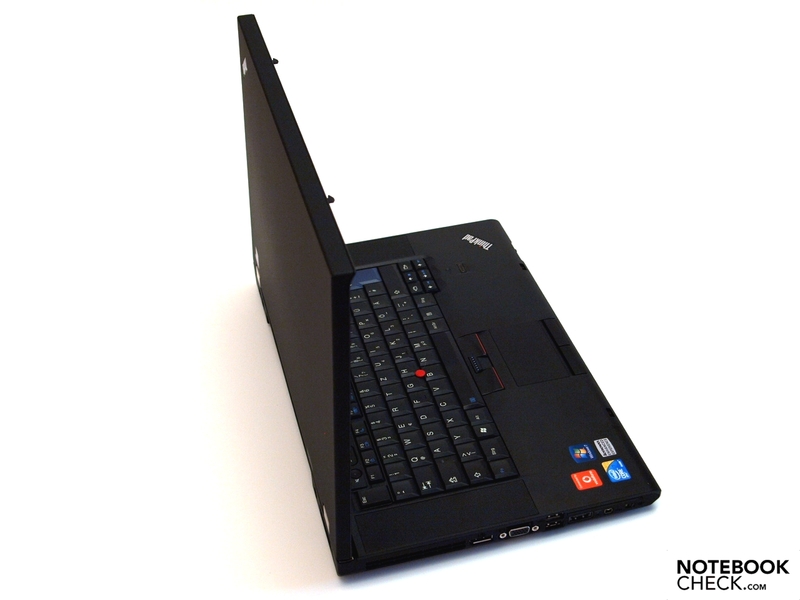 Lenovo's ThinkPad T-range provides efficient, robust models for mobile business use. Just like the T500s that have been available for some time the T510s are 15.6 inch laptops. They only differ insignificantly on the outside. 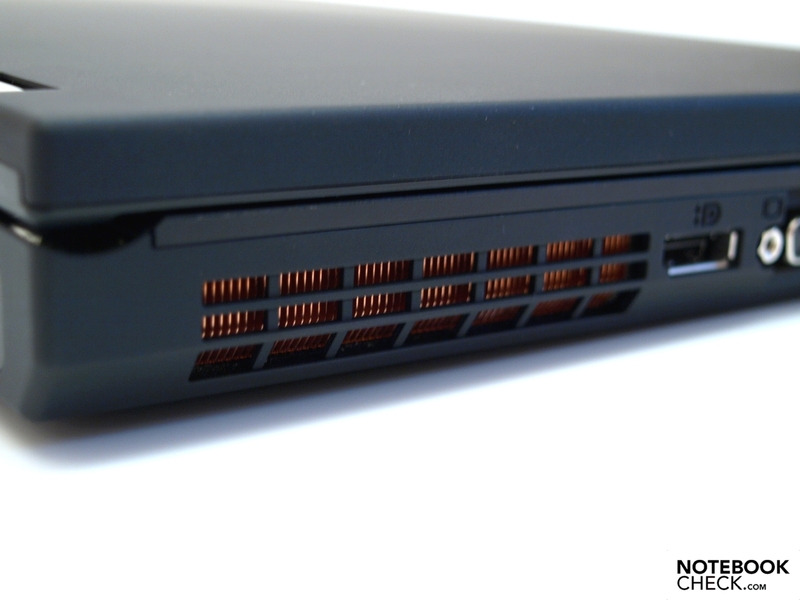 But the T510 uses Intel's new innovations inside. A few T510 models only have an Intel GMA HD graphic chip integrated into the Core i processor. 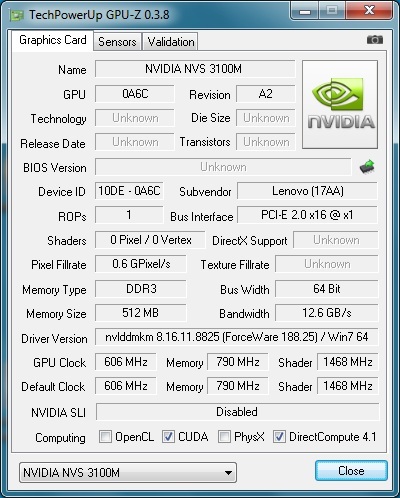 Then again, others use the possibility of a dedicated Nvidia NVS 3100M graphic card. 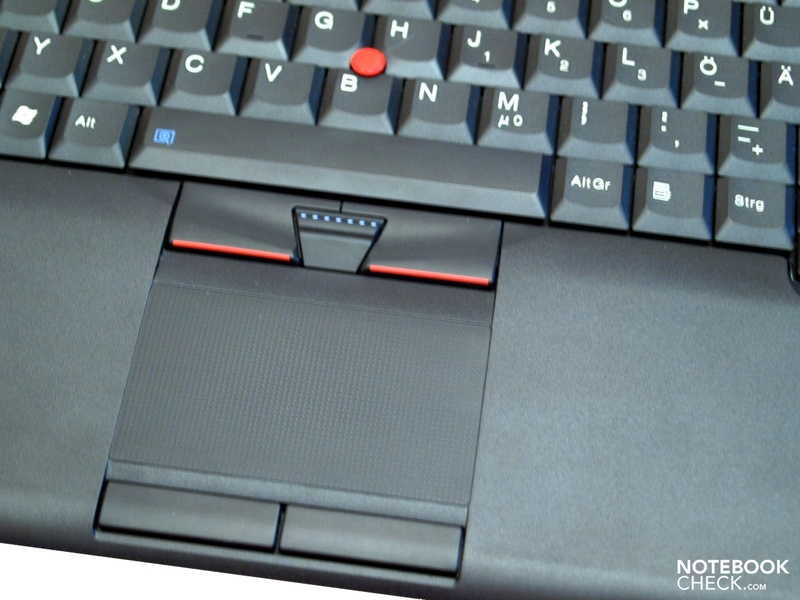 The exact name of our model is "ThinkPad T510 - 4349-4JG". Because the inner workings of the single models differ to a large extent, some sections that are strongly related don't apply to other models. 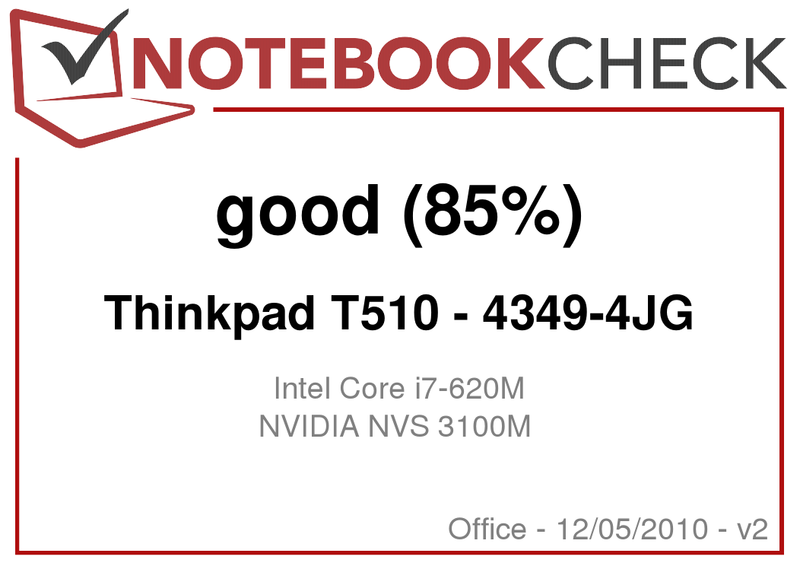 One thing first: As already the reviewed ThinkPad T410, the ThinkPad T510 model, with a discrete graphic card, at hand doesn't have switchable graphics. 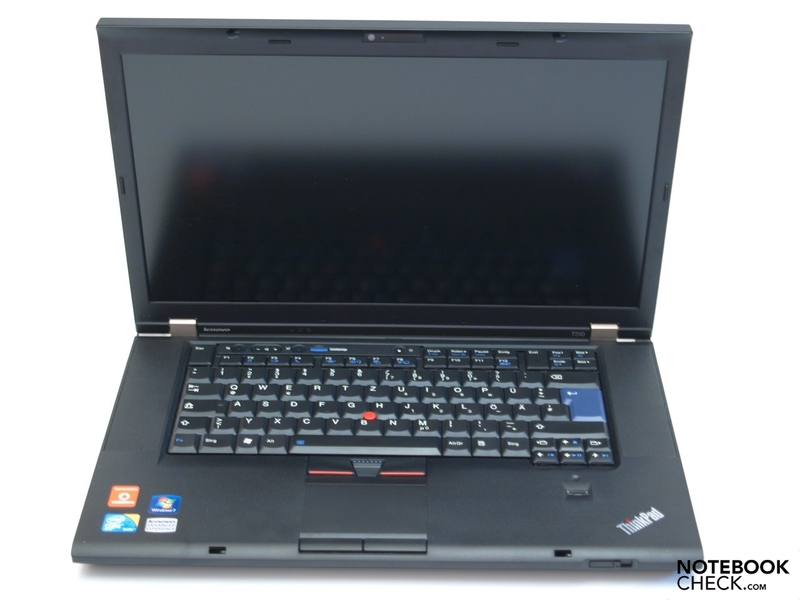 The design of the T510 is basically an enlargement of the T410. 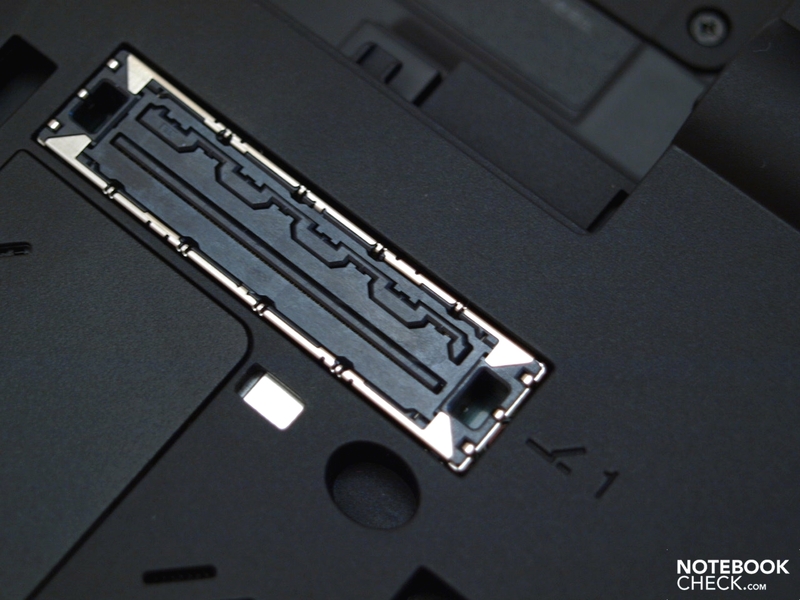 Apart from the typical ThinkPad design components - the blue return key, red trackpoint, according logos and not to be forgotten blue "ThinkVantage" button, the silver hinges and various inevitable stickers, it has been made completely in matt black. However, the T500's 16:10 aspect ratio has been abandoned. The 15 inch update now has a cinematic-friendly 16:9 format and measures 373 millimeters in width, 279 millimeters in depth and 40 millimeters in height. Compared to its predecessor (W: 358mm D: 255mm, H: 34mm), it has grown in all directions. It has also gained a bit of weight with about 2.8 kilograms. The base unit scores with an excellent torsional stiffness. The pressure resistance is also very good, with exception of the Ultrabay's vicinity as a weak spot already known from the forerunner. The display lid can resist the applied forces well when it's picked up at an edge and it barely twists. It also copes well with selective pressure. But the display bezel even yields under slight pressure, whereby image deviations become visible on the turned on screen. 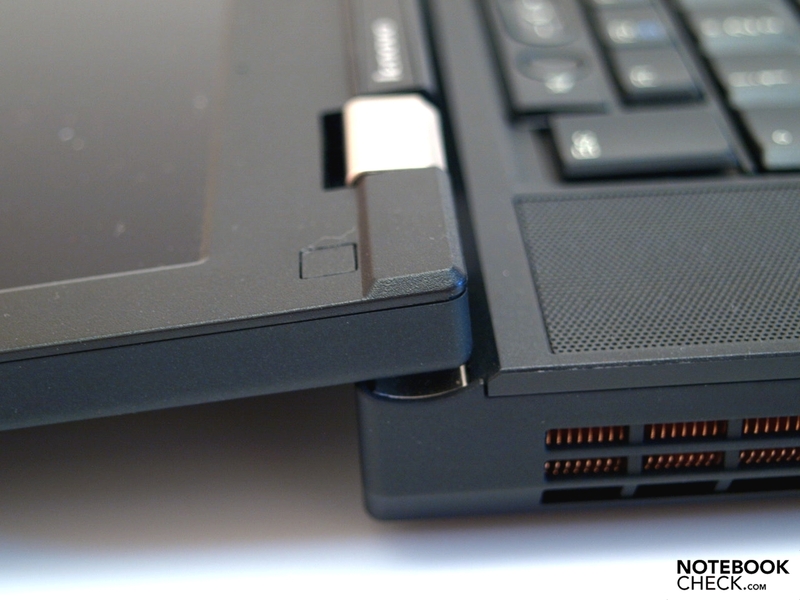 The hinges appear to be a bit small in relation to the laptop's size, but barely allow a teetering after opening angle adjustments. However, they are too smooth in order to prevent an autonomous opening angle change in rugged surroundings (train journeys). In return, a single-handed opening and closing isn't a problem. The display can be opened to a maximum of 180 degrees. 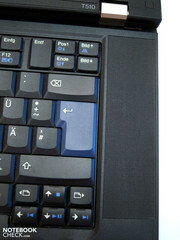 A double hook closure system and the known Clamshell design bid protection against foreign objects unintentionally penetrating the gap between keyboard and display. The opening mechanism is easy to operate, but creaks a bit. 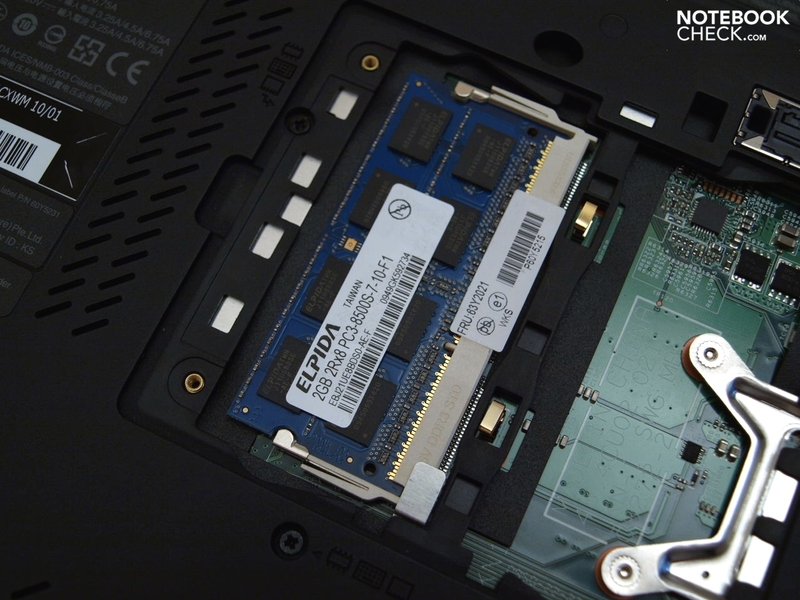 Beside the hard disk, the RAM modules are easily accessible via maintenance covers. In comparison to the smaller T410 only the interface distribution has been slightly modified. Otherwise, connectivity, communication configuration and operating system options and supplies, are the same. 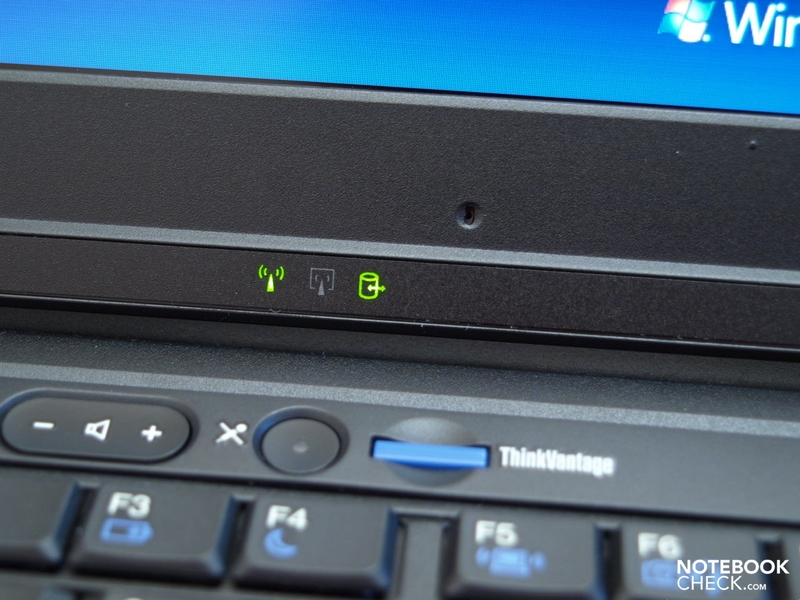 Typical for a business device, you'll of course find a docking port on the laptop's bottom. Thus, the 15.6 incher can't only be easily connected to an existing work environment, but the interface alignment can also be extended. 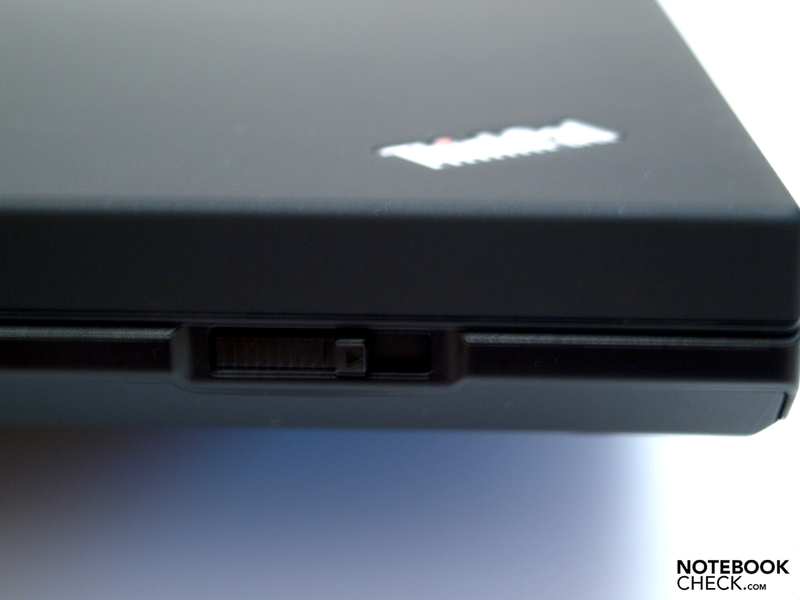 Merely the ThinkPad Port Replicator Series 3 is offered in the United Kingdom and has 4 USB connections, VGA and LAN. In opposition, there are currently 4 different docking stations offered in the United States. However, one of them is connected via USB. 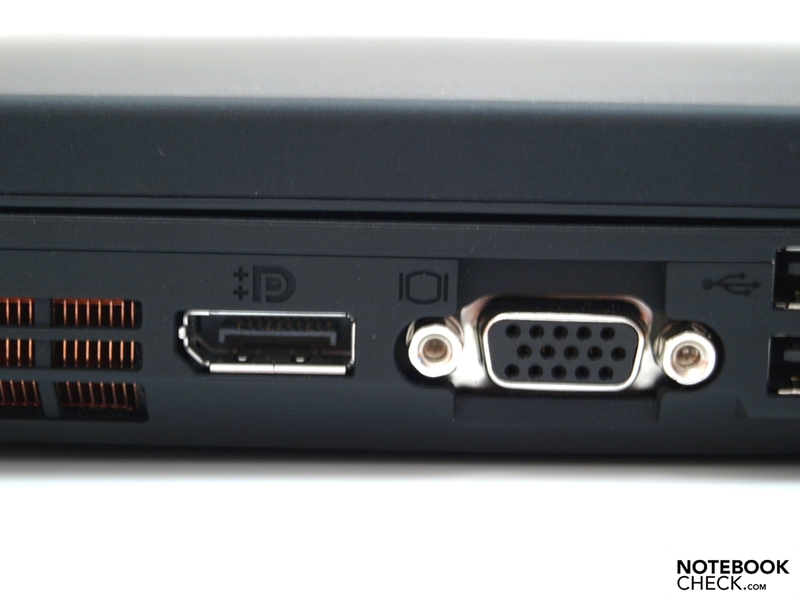 Therefore, only three options are left using the docking port: First, the ThinkPad Port Replicator Series 3 for around 149 US dollars, second the ThinkPad Mini Dock Series 3 (US/Canada/LA) with 6 USB 2.0 ports, VGA, DVI, DisplayPort (2 video interfaces can be used simultaneously) and an analog headphone and microphone socket for about 229 US dollars. 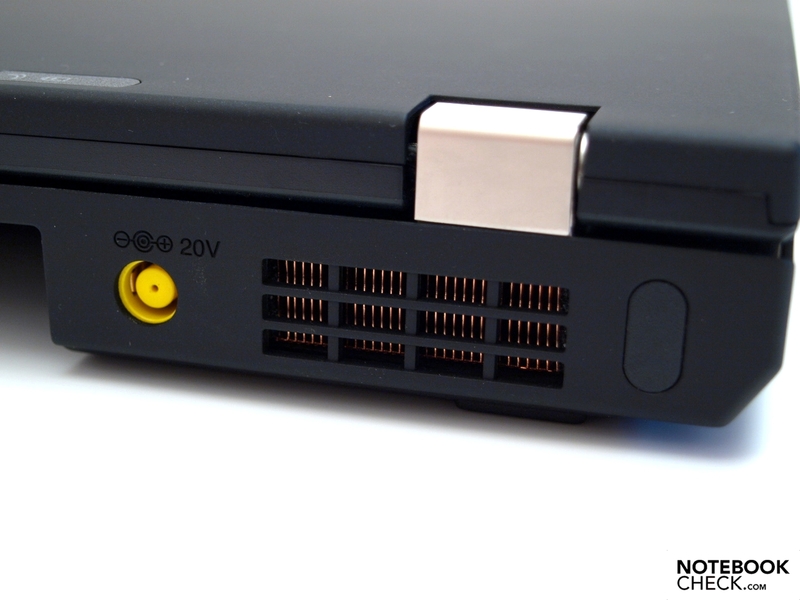 And the third option is the ThinkPad Mini Dock Plus Series 3 (US/Canada/LA) with an additional DVI and display port, RJ-45 and eSATA connection for around 249 US dollars. You can practically ban all cables that might restrict the work space on the notebook's sides to the back with the latter. 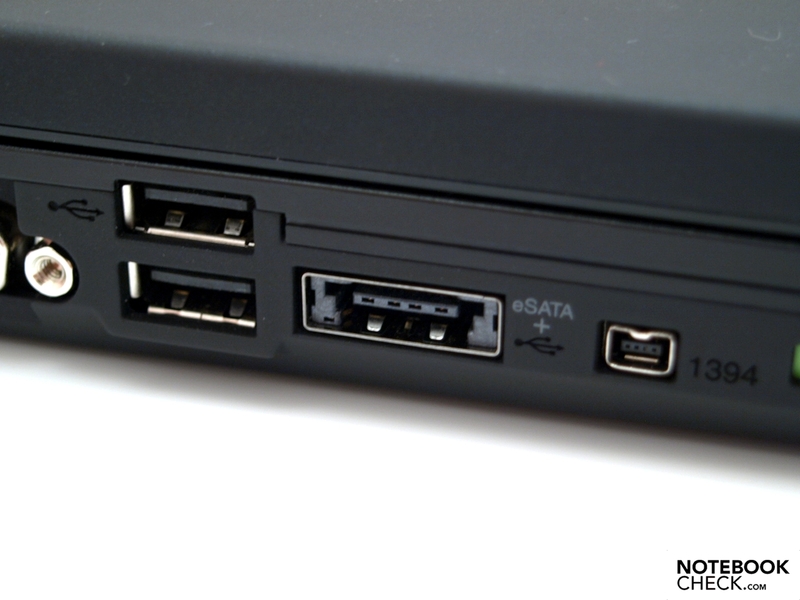 Three USB 2.0 ports, one of which is a combined USB/eSATA interface, are found directly on the case's left. The left also accommodates video sockets, a VGA for analog transmissions and a digital display port, a FireWire interface and the WiFi main switch. 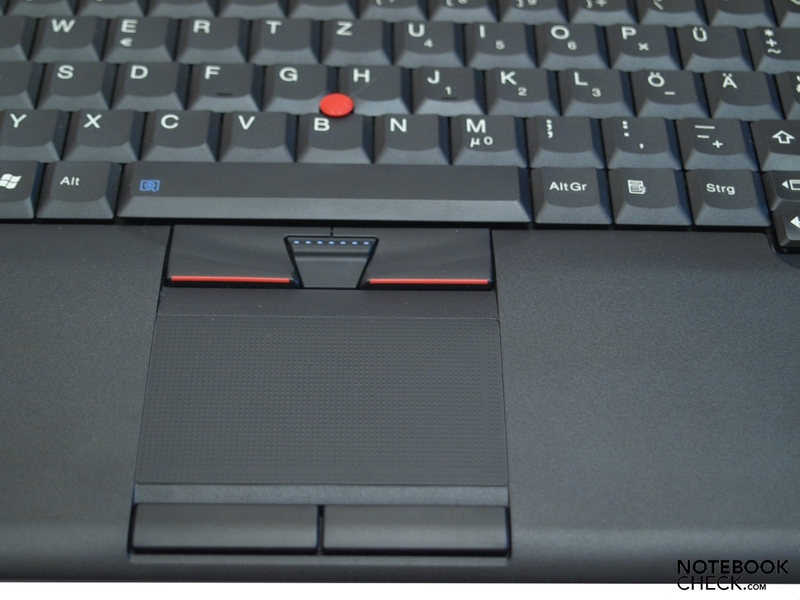 Therefore lefties will have their difficulties with the T510, depending on the occupation, without a docking station. It looks better for righties. The only cable in the front area leads to the combo audio socket. Aside from that, the right bids an ExpressCard/34 slot, a 5-in-1 cardreader (as usual: MS, MS Pro, SD, SM, MMC), an Ultrabay slot and in the very back, an RJ-45 LAN connection. The beveled front remains unfettered from interfaces. 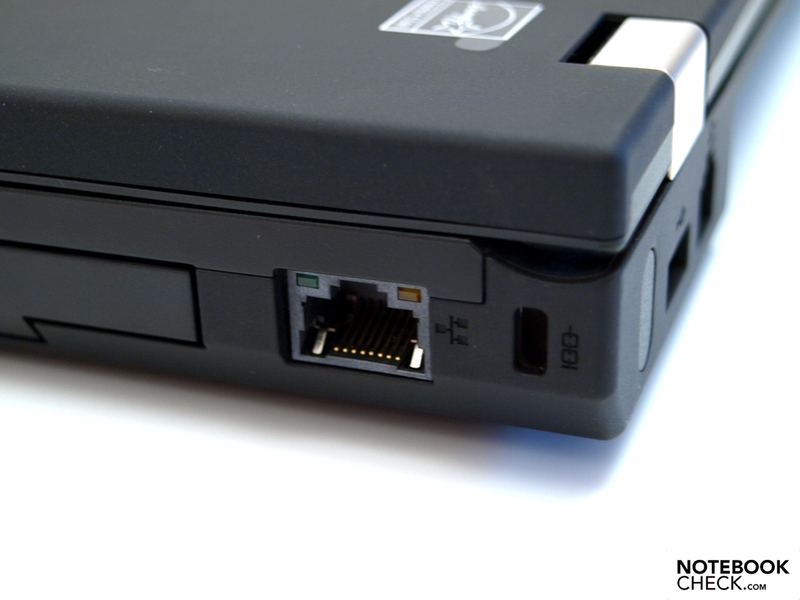 A fourth USB port and an RJ-11 modem port are on the rear. 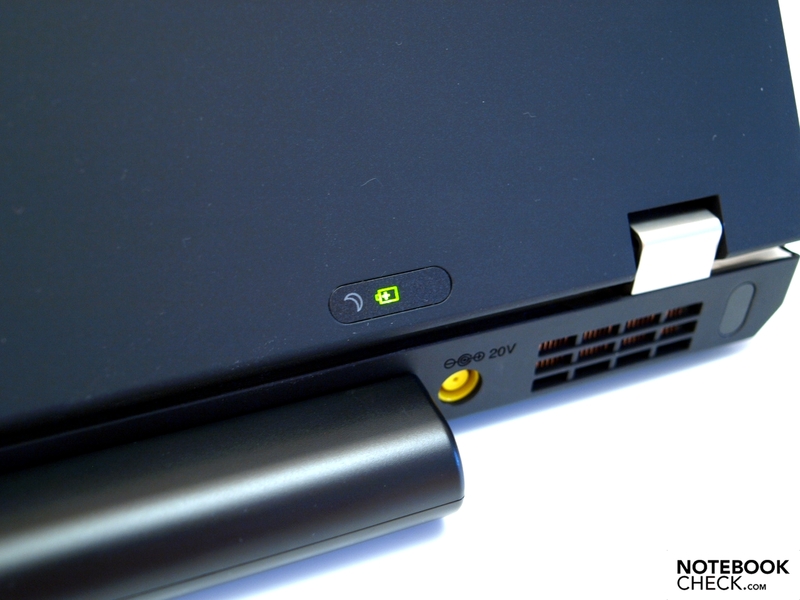 Lenovo has practically put all useful and available communication features into the ThinkPad T510. You can exchange data wirelessly with small external mobile devices, for example a cell phone or PDA, over Bluetooth 2.1. A GOBI 2000 from Qualcomm is available as a broad band modem. 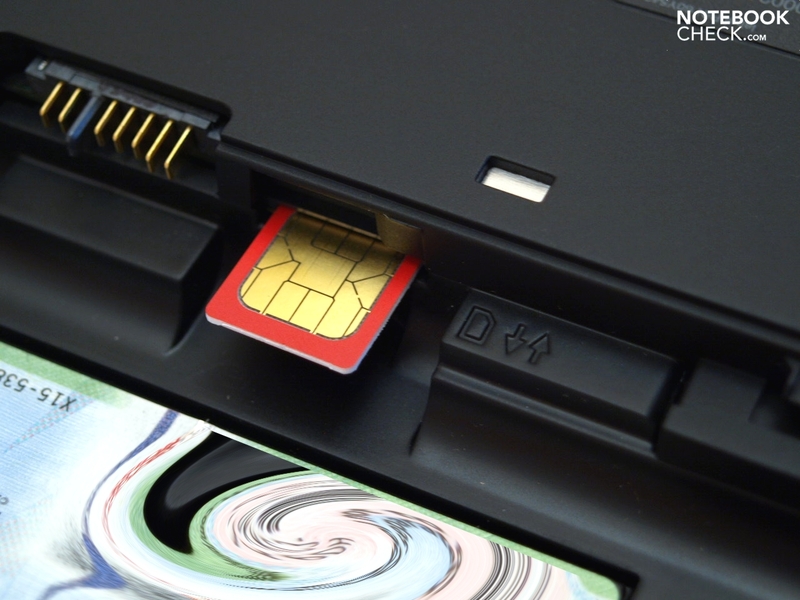 A SIM card from Vodafone is also included right away. 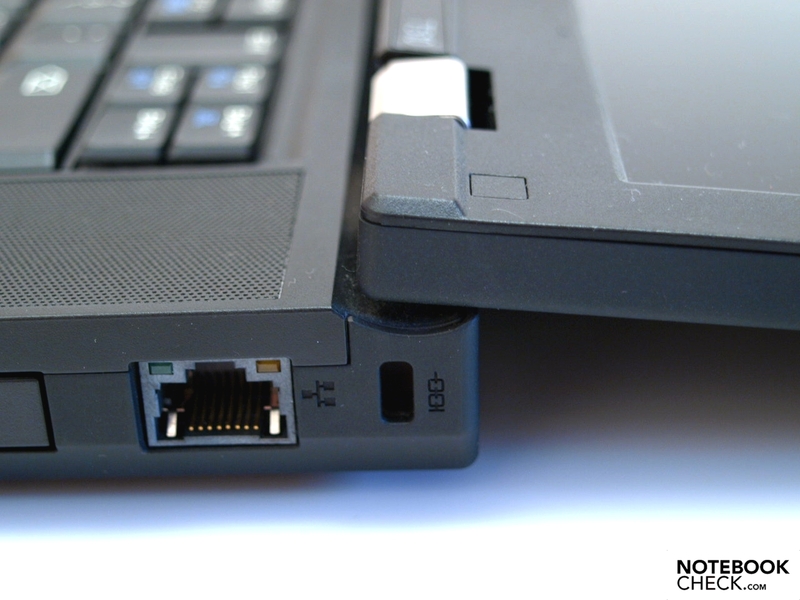 Fast connections via WiFi hotspots with the built in Intel Centrino Ultimate-N 6300 AGN (agn) are even possible with n-standard support if necessary. Other configurations are possible depending on the model. 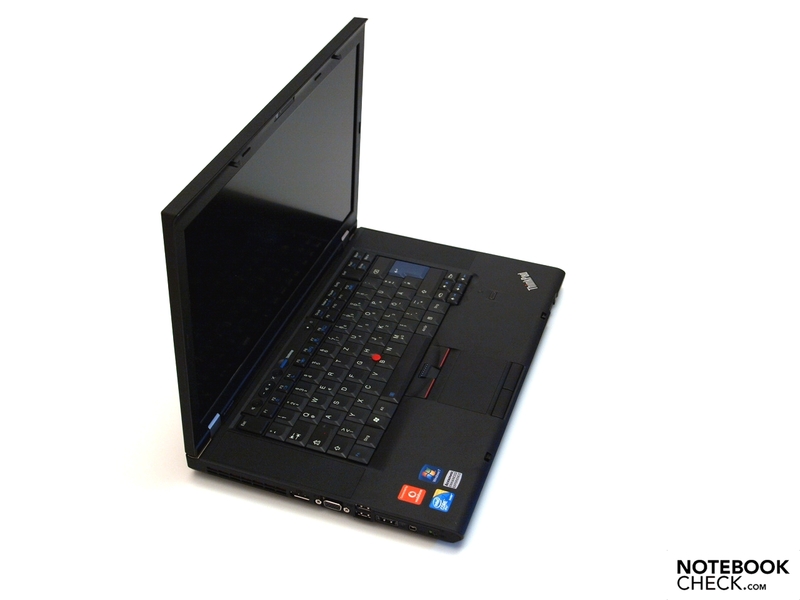 However, and not surprisingly, the same ones as for the smaller T410 are offered. For cabled use, there is an Intel 82577LM gigabit network connection for Ethernet connections available on the one hand, as well as a RJ-11 modem connection that could make an internet connection via a telephone cable possible in areas with a sparse infrastructure on the other. So, basically internet telephony and electronic mail with business partners shouldn't be a problem. Even video telephony via internet is possible without further ado due to the built-in 2.0 MP webcam. 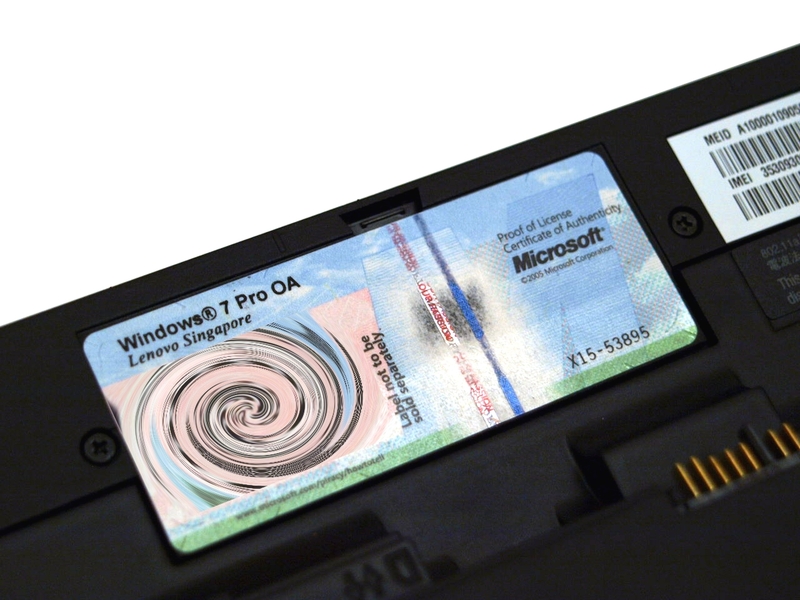 Windows 7 Professional 64 bit had been preinstalled on our prototype. 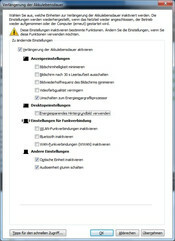 Optionally, Windows 7 Ultimate can also be selected. 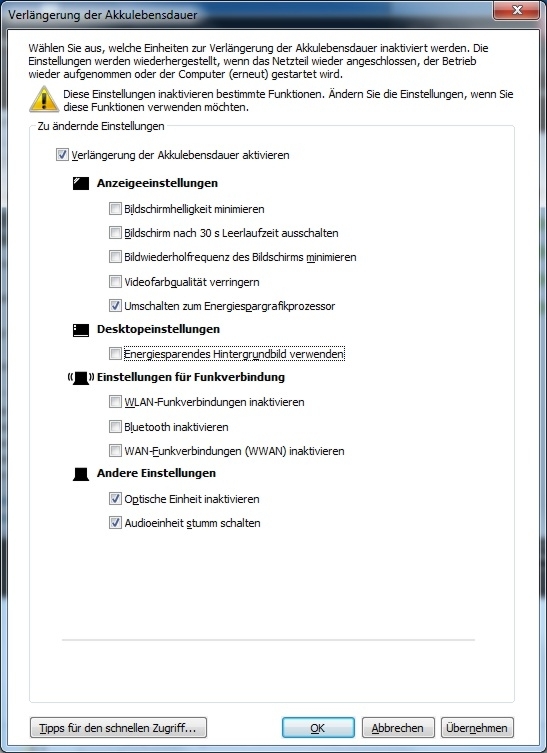 Both Windows 7 versions are also available as a 32 bit option. A 32 bit operating system doesn't seem sensible in our prototype already in view of the memory size of 4 gigabytes - unless there are only 32 bit drivers for existing peripheral devices available. 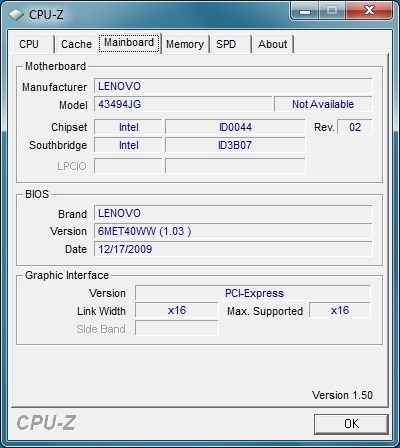 Lenovo has made a few modifications in Windows 7 and has tried to optimize Windows 7 with that. 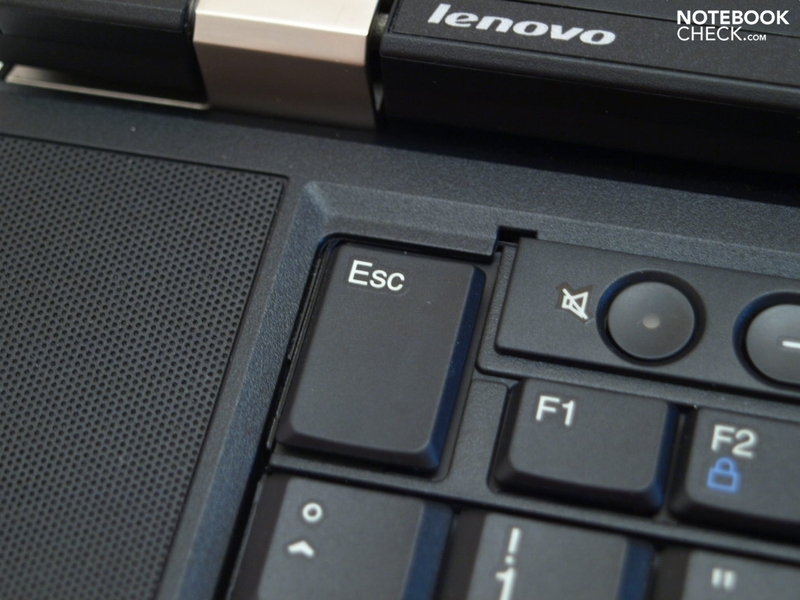 The Lenovo Enhanced Experience Technology is supposed to make a faster booting and shut down possible. This statement is made by the manufacturer and hasn't been checked. Lenovo has been very stingy in terms of supplies Only a few sheets of paper are in the box along with short instructions. Recovery DVDs, driver media or even Windows 7 installation media is looked for in vain, though. 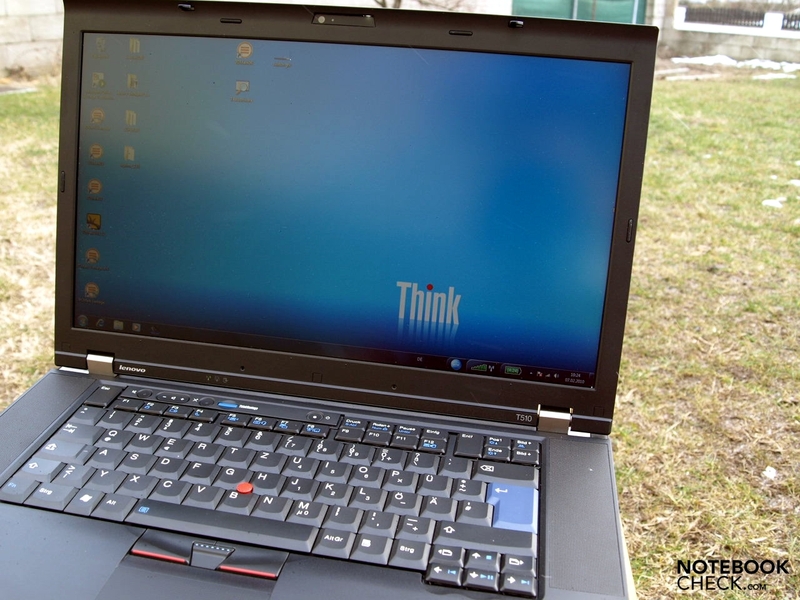 In return, you can easily create this with Lenovo's ThinkVantage tool. This tool also supports a recovery from a hard disk partition. 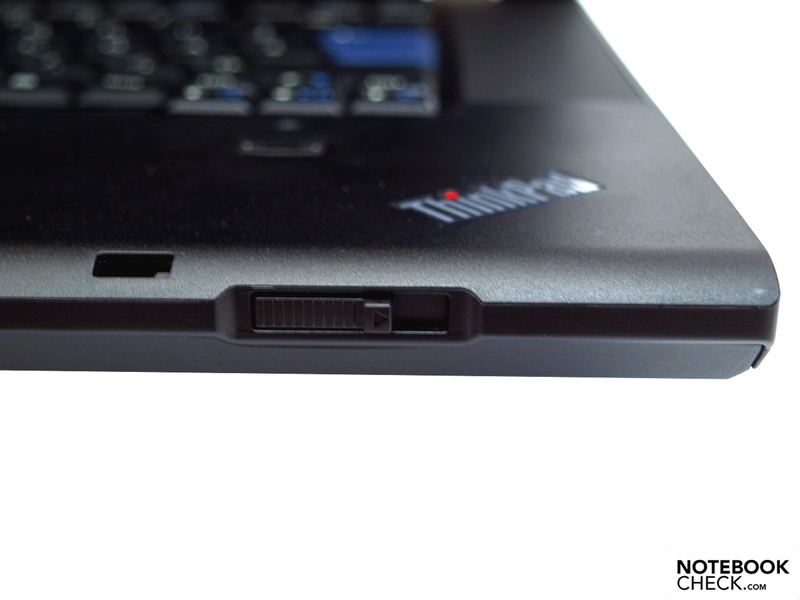 The ThinkPad T510's security features include a Kensington Security slot, a splash water protected keyboard and a fingerprint reader that has to be configured with the ThinkVantage tool before use. A smartcard reader is optionally available. The warranty only includes 1 year bring-in service in the USA. Various warranty extensions can be purchased. A 3 year onsite service (Priority) costs around 279 US dollars. 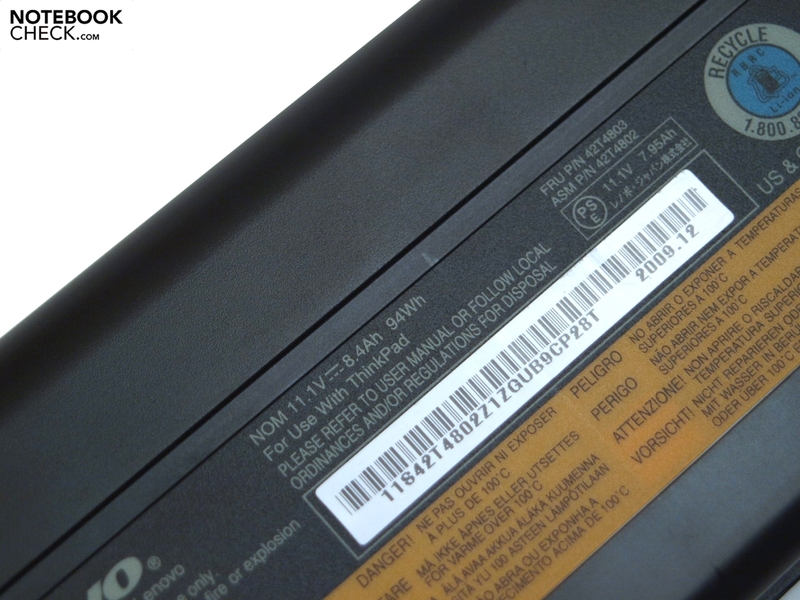 The warranty period for ThinkPad T-range models is standardly 3 years in Europe (bring-in). 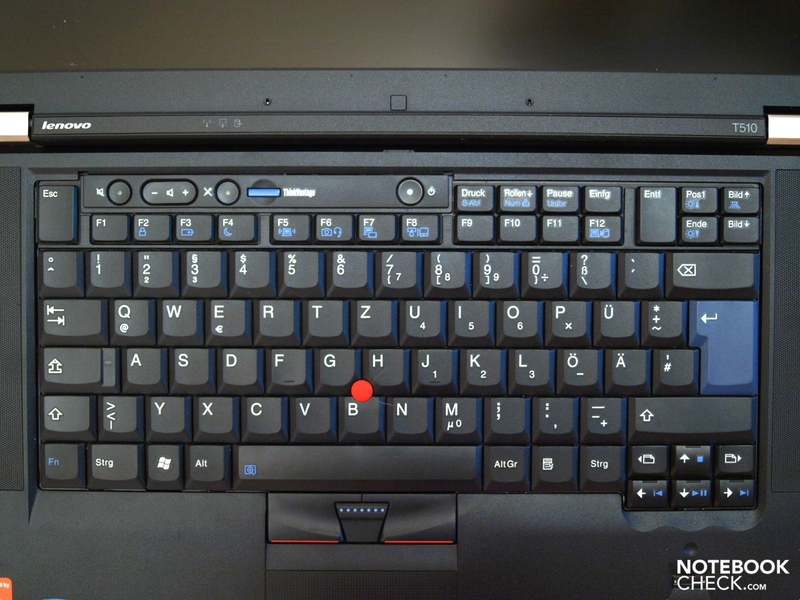 You won't find any differences in input devices in comparison to the smaller ThinkPad T410, either. The bigger case size hasn't been used for a numerical block, but the loudspeaker covers have been broadened instead. 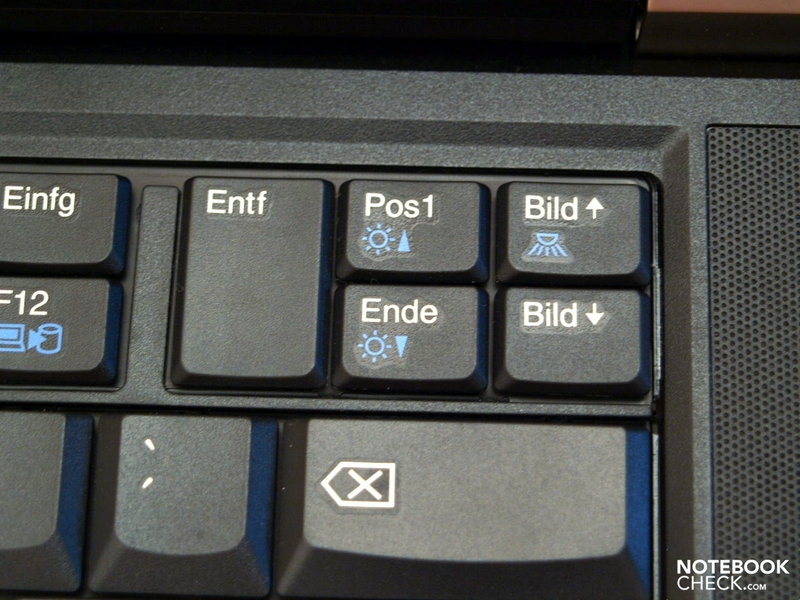 The splash water protected keyboard has a standard layout with the IBM/Lenovo typical interchanged CRTL and FN keys. Additionally, the keys have been clearly grouped. The ESC and DEL keys have been elongated. The INS key had to leave the DEL key's group. So, you'll hopefully not hit the INS instead of DEL as fast, which would lead to an unintentional change to the insert mode in word processing. 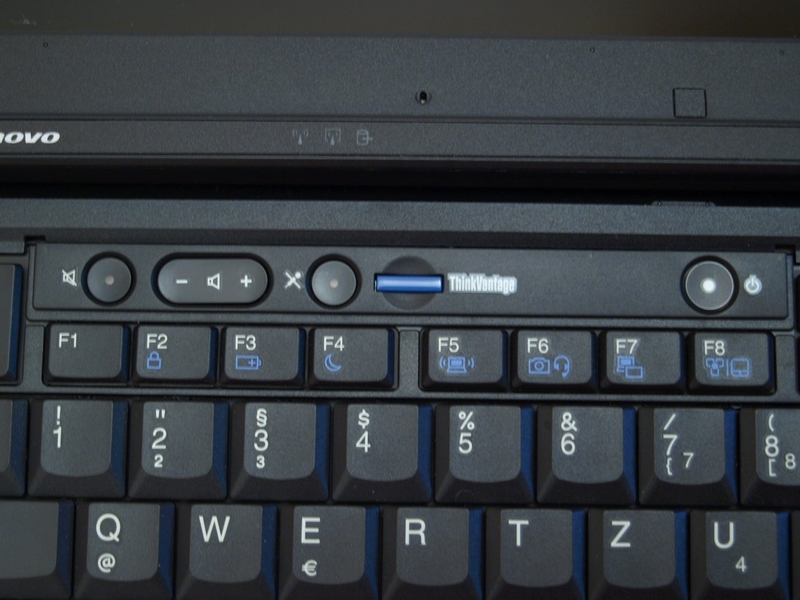 The hot key bar also correlates to that of the T410 and has aside from the ThinkVantage button, keys for volume regulating and for microphone control. 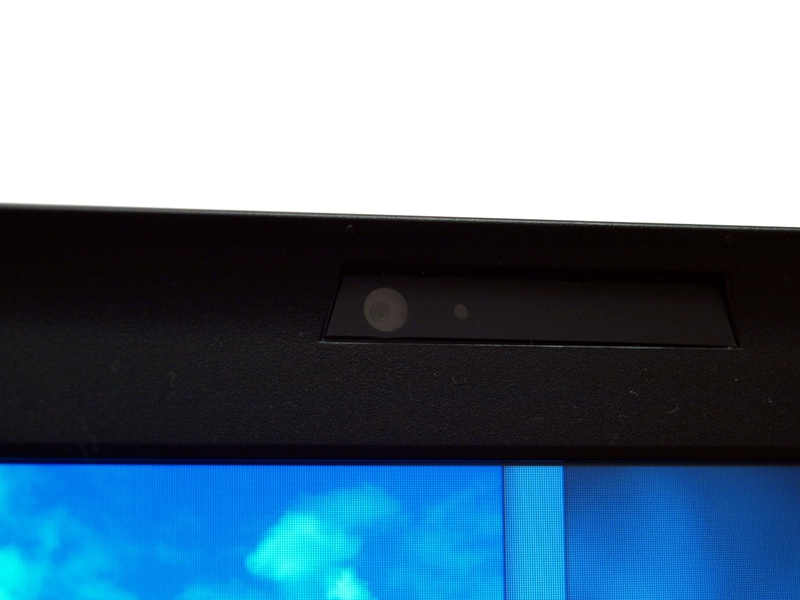 The keyboard light has its place in the upper display bezel again and can be controlled with FN+PAGE-UP. As usual there's nothing to complain about in terms of the keyboard's mechanical traits. Concave key surfaces add to the typing comfort. Unfortunately, the keyboard gets quite loud especially at vigorous typing, in particular the space key. But touch typing is a delight right from the start. 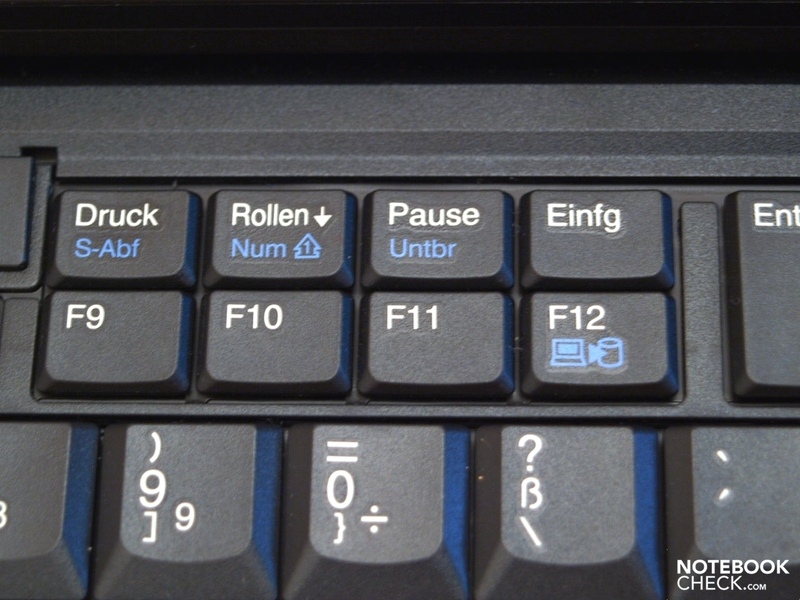 The touchpad and trackpoint can be enabled or disabled independently with FN-F8. The touchpad now supports a few multi-touch gestures and you can scroll with its assistance, as well as with the (not very contrast rich) optical and haptical marked scroll field. But the mouse cursor control isn't perfect any longer. One of the multi-touch features is frequently triggered unintentionally. 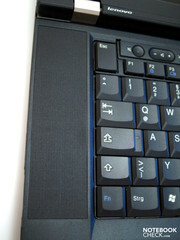 The touchpad surface has also been redesigned. The surface is now slightly knobby and feels a bit grainy. The gliding traits are alright, though. 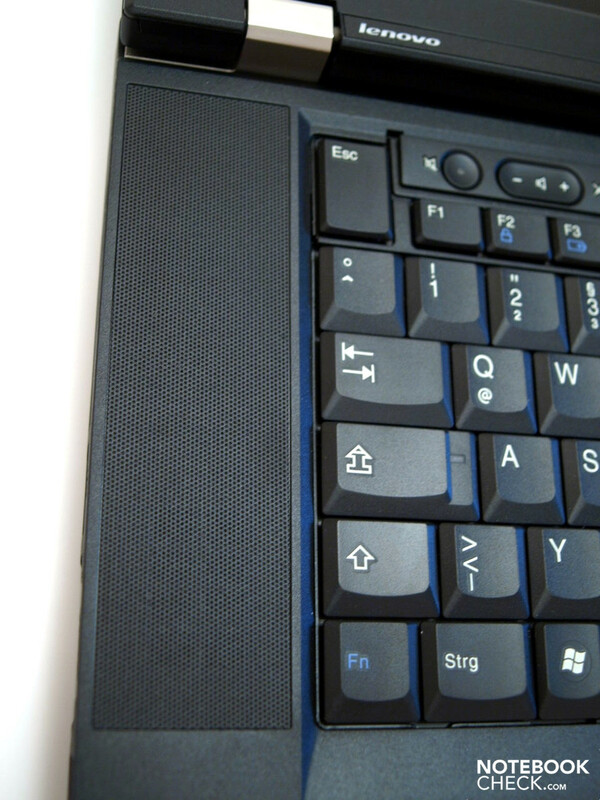 The touchpad barely delimits itself from the surrounding case by a simple component seam. 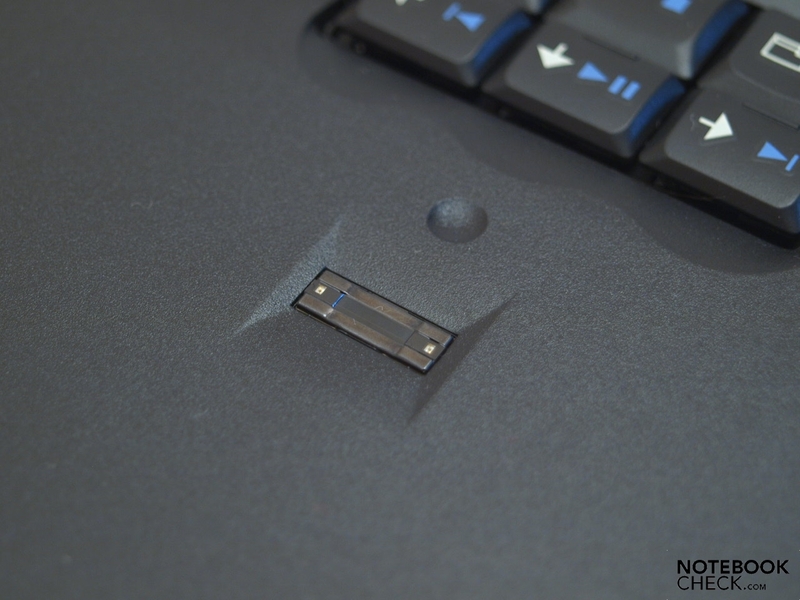 A part of the touchpad buttons are already on the beveled edge. They are smooth, respond well on their entire width and don't make a too loud click noise, either. Alternately, the red trackpoint can be used. It allows a very precise mouse cursor control without readjusting. The correlating buttons work well and not too loud. Appropriate for business, a matt display has been used in the T510. All available displays have an LED backlight and a cinematic-friendly 16:9 aspect ratio. According to the manufacturer, the three following options are available: a 15" HD (1366x768) with 220 nits, a 15" HD+ (1600x900) with 220 nits and a 15" FHD (1920x1080) with 280 nits and 95% color gamut. The 1600x900 pixel screen is built into the prototype. 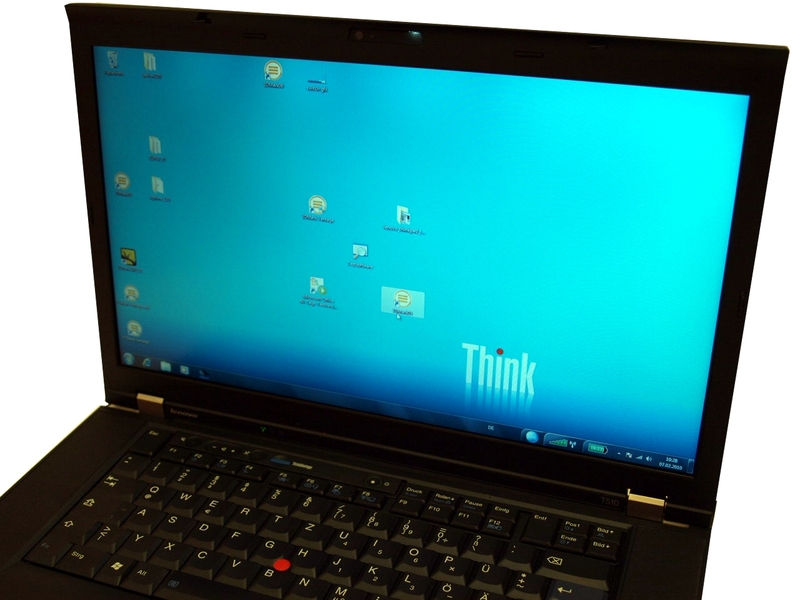 In opposition to the T410, Lenovo has changed to a 16:9 format in the T510, which reduces the black bar in movie rendering but lessens the height in vertically orientated office applications so that you might have to scroll more frequently. 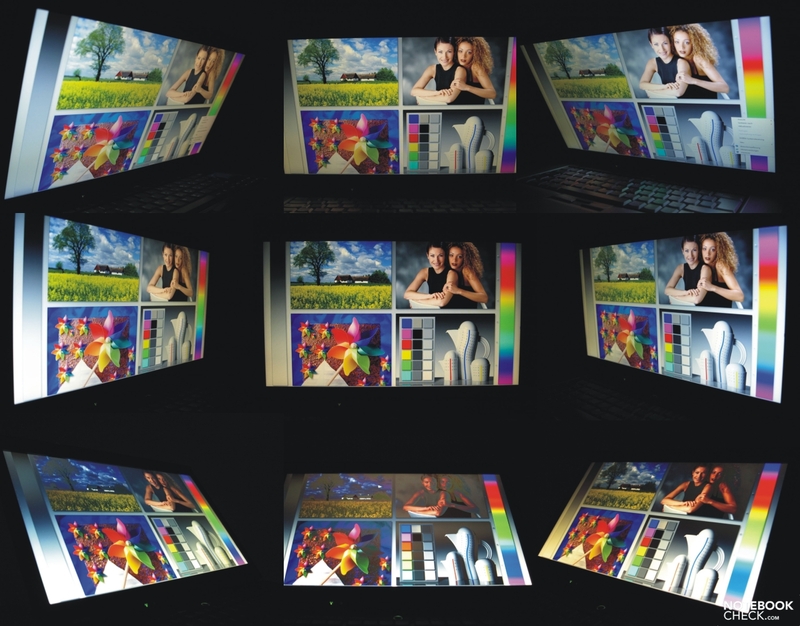 The display really does achieve the 220 nits heralded by the manufacturer in some image sectors. But the brightness decreases strongly away from the brightest area in the center, especially towards the left. The illumination is still a good 79% with the lowest rate of 175.7 cd/m2 in the center left image area. A very good contrast ratio of 1:569 is assessed with a fairly low black value of 0.39 cd/m2 and the maximum brightness of 222 cd/m2 in the display's center sector. 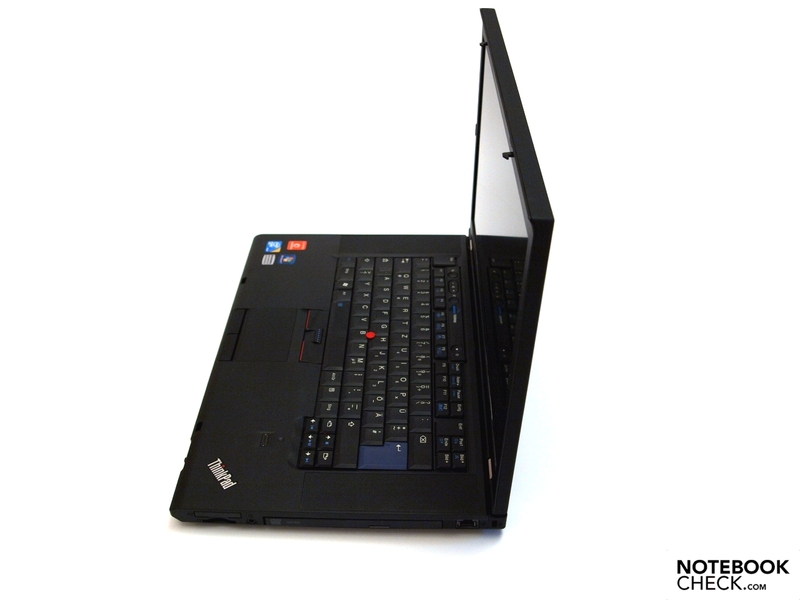 Basically, it can be said that it has better measuring results than those, which we determined for the T410. Subjectively, there isn't a reason for complaint in terms of color representation. You can't see any shading with the naked eye on monochrome backgrounds, either. Matt surface and a maximum brightness of about 220 cd/m2, which is also available in battery mode, also allow the notebook to be used outdoors. The display's content remains well visible. It could perhaps be a bit brighter for use in direct sunlight from behind the user. The viewing angle stability are generous on the horizontal plane and, notebook typically, tight vertically. Already the slightest deviation from the ideal, perpendicular viewing angle leads to image distortions in form of dimming or over-illumination. Additionally, color changes turn up quickly when looking downwards. 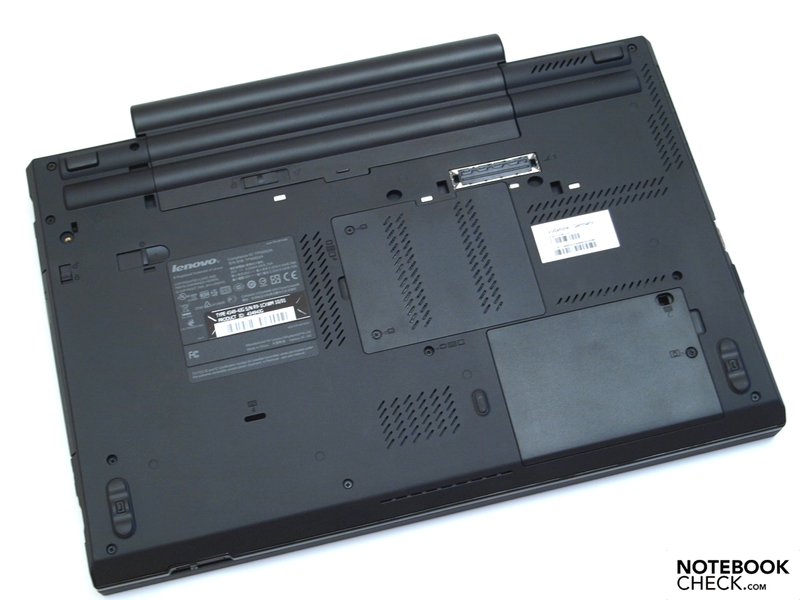 Just like in the ThinkPad T410 the ThinkPad T510 has a few configuration alternatives in terms of performance responsible inner components. Therefore, you should closely look at which components are really built-in. In any case, the laptop uses one of the new Core i processors that are manufactured under the code name "Arrandale". 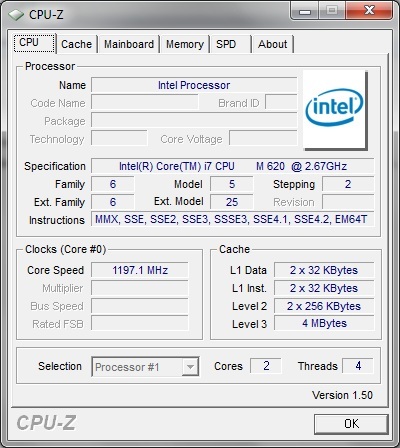 The options range from an Intel Core i5-520M (240GHz, 3 MB L3, 1066MHz FSB) as the least efficient alternative, over Intel's Core i5-540M (2.53GHz, 3MB L3, 1066MHz FSB) up to Intel's Core i7-620M CPU (2.66GHz, 4MB L3, 1066MHz FSB). Additionally, some models with only an integrated GMA HD graphic chip and others with a dedicated Nvidia NVS 3100M graphic card are offered. 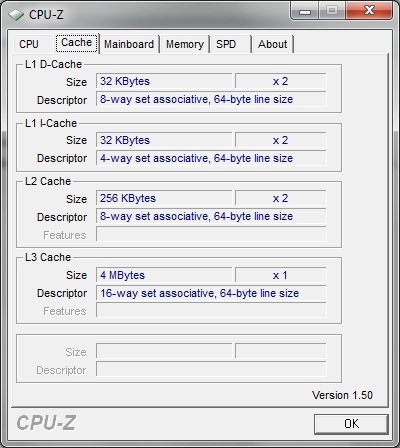 A main memory configuration of two to eight gigabytes is available ex-factory. Our prototype is based on Intel's mobile QM57 Express chip set (Intel ID0044 chip set) and has an Intel Core i7-620M processor, Nvidia Quadro NVS 3100 graphic card, and a 4 GB DDR3 (PC3-8500F; 533MHz) RAM. The Nvidia Quadro NVS 3100M is a DirectX 10.1 capable business graphic card that is based on the GT218 core (GeForce 210M, 310M) and therefore only supplies starter performance. The drivers are specialized for business applications and should provide a maximum compatibility and stability. It supports decoding HD videos (H.264, VC-1, MPEG-2, MPEG-4 ASP) with PureVideo HD (VP4). CUDA and DirectX Compute accelerates video decoding for example. Nevertheless, the Quadro NVS 3100M's 3D performance stays in the starter field. A considerably better graphic performance can be expected in comparison to models with an integrated GMA HD graphic chip, anyway. Generally, you can expect a solid , stable, and good office performance, though. If our expectations can be lived up to can be seen right away when we look at the benchmarks. 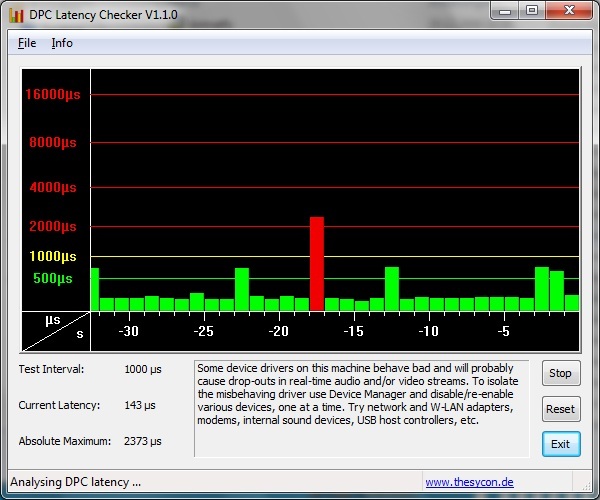 To exclude problems caused by too long latencies when external devices are connected, we looked at them with the DPC Latency Checker. Unfortunately, there were repeated spikes in the yellow and even in the red field. The reason can possibly be determined by selectively disabling drivers and the problem solved by a driver update. 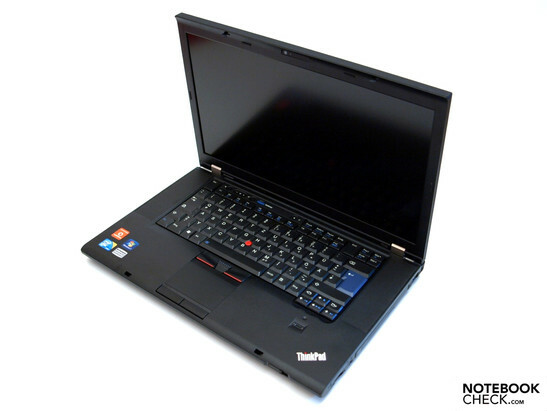 In the following we compare the T510 to both the T500 (Mobility Radeon HD 3650 / P8600, 2 GB RAM) and the T410. We'll also use another device with more modern but comparable hardware, namely the Dell Studio 1557 for our comparison. In comparison to Dell's Studio 1557 that competes with a Mobility Radeon HD 4570 from ATI, a four GB RAM and a 320 GB, 7200 rpm hard disk, the Studio scores a bit better in the overall result of PCMark Vantage and especially scores with a better gaming rate and in the productivity score. 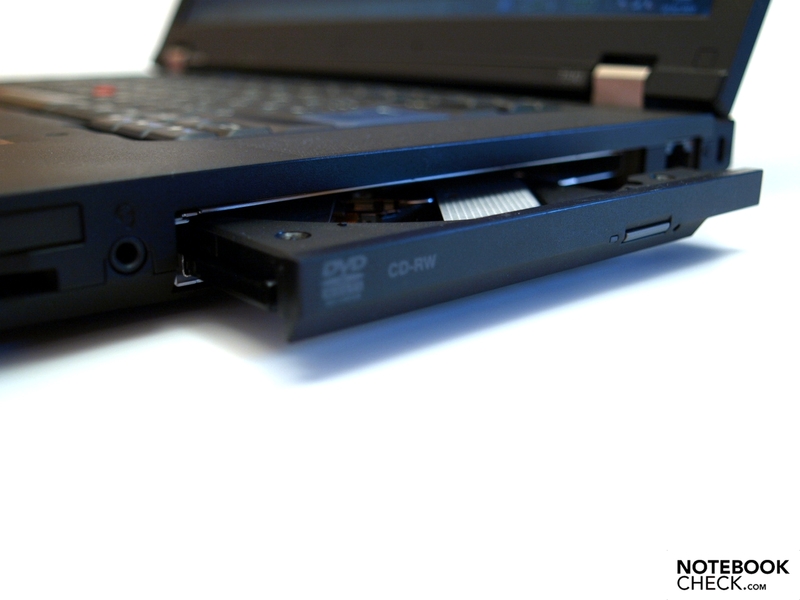 In return, the ThinkPad T510 can boast with a better score in hard disk performance and communication. 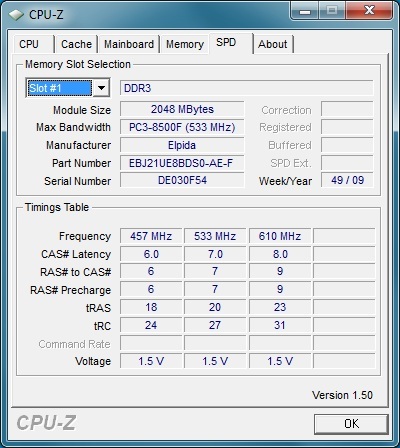 The Dell Studio 1557 is, more or less, clearly in the lead in the Cinebench test. Whilst either the Dell Studio or the ThinkPad T510 scores better to a part in the 3DMark tests. 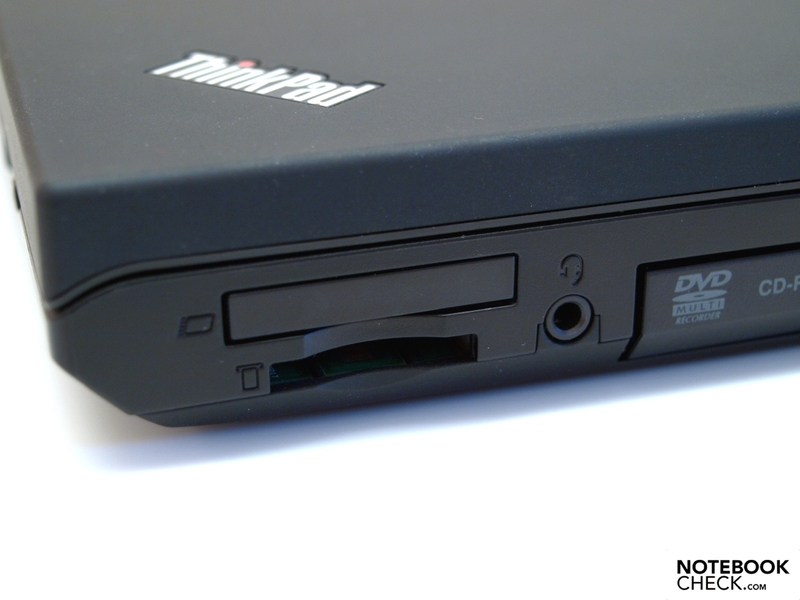 The comparison to the reviewed ThinkPad T500 is much fairer than in the T410 review, as our T500 prototype had also been equipped with a discrete graphic card. All in all, the T500 can score in 3D-biased benchmarks: +13% in 3DMark01, +8% in 3DMark03, +21% in 3DMark05, +19% in 3DMark06 and finally + 28% in Cinebench rendering. In return, the T510 has the lead in CPU-biased benchmarks: +4% in 3DMark06 CPU, 33% in Cinebench single rendering and +58% in Cinebench multi rendering. Unsurprisingly, there are only slight deviations to be recorded in comparison to the ThinkPad T410. As expected, the T510 can serve with a better performance in terms of hard disk performance in comparison to its forerunner. 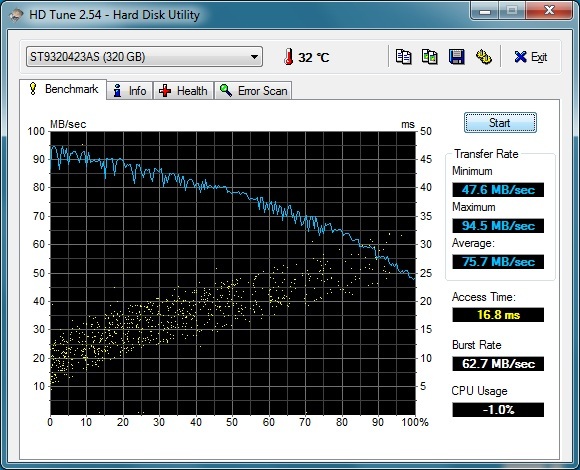 The Seagate ST9320423AS with 320 GB built into the prototype works with 7200 rpm. It belongs to the Momentus family and you can find details about it under Momentus 7200.4 on Seagate's web site. According to the manufacturer, it's supposed to be especially energy savings. At least, there weren't any irregularities recorded in the velocity measurements. There are a few differences depending on the model in this case, too. 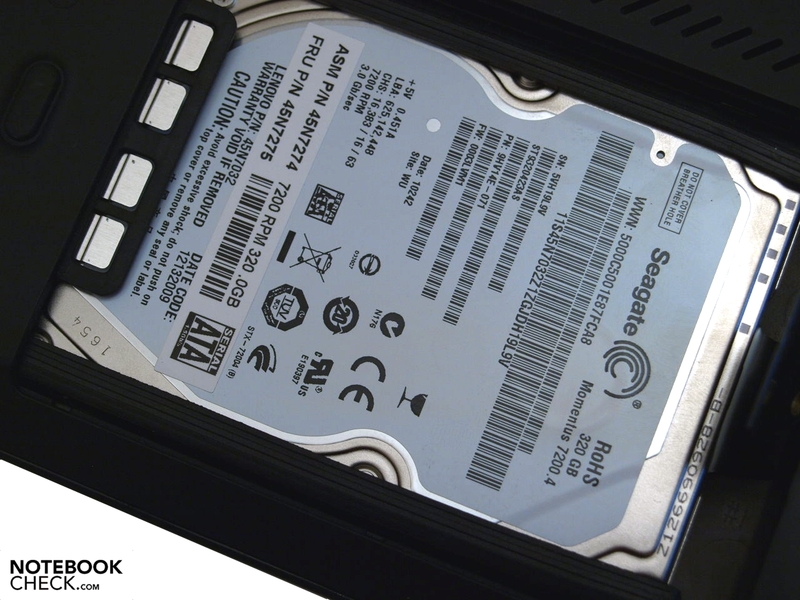 Apart from the 5400 and 7200 rpm hard disks, a 128 GB Solid State Drive is also offered. A HL-DT-ST DVDRAM GT30N has been built into the prototype as an optical drive. Because a business device isn't made for gaming, but computer games reflect the 3D performance capabilities of a computer system well, they belong to our test course for all, in terms of graphics, halfway efficient systems. One thing first: The Nvidia Quadro NVS 3100M arranges itself in our performance class 3, which represents the lower middle class. Therefore, we aren't expecting any very big leaps. The drivers have also been optimized for business applications, which means they have been aligned for maximum compatibility and stability and not for gaming performance. As expected, the performance is only sufficient for demanding games in minimum details and low resolutions. It was enough for 58 fps in Anno 1404 (2009) in a resolution of 1024x768, low presettings and disabled vsync. It's only still 11 fps when the demand is increased to a resolution of 1280x1024 pixels, very high presettings and disabled vsync. We also receive a similar picture for Crysis in a resolution of 1024x768 pixels. The game internal CPU and GPU benchmarks indicate 54 fps (GPU) and 48 fps (CPU) in low settings, 20 fps for both in medium and about 11 fps (GPU) and 10 fps (CPU) in high settings. Therefore, a smooth game enjoyment is only possible in low settings. It looks better with older and less demanding games. We selected Call of Duty 4 for our test and can confirm that it still achieves a playable 30 fps in high details - that is a resolution of 1280x1024 pixels, 4xAA and settings enabled and high. We'd like to refer to our gaming list and our graphic card benchmarks for further information. Subjectively, the fan noise is always existent, but also always still well acceptable. Sometimes a high frequent whistling can be heard. This is also confirmed with our assessed rates. We record a maximum of 37.2 dB(A) under load. Therewith, a very audible, but not particularly loud rate is reached. 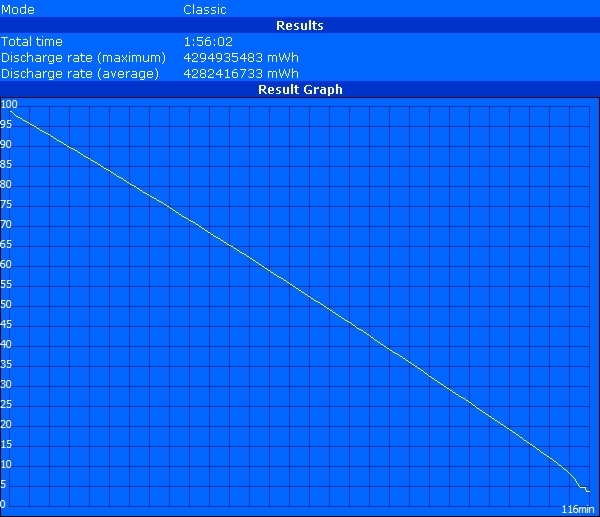 It's 35.4 dB(A) on average under load. The volume during use under low load is between 32.9 and 33.8 dB(A). The system noise in DVD rendering also remains within a limit, but the DVD drive proves to be quite loud in data transfer with 45.1 dB(A). 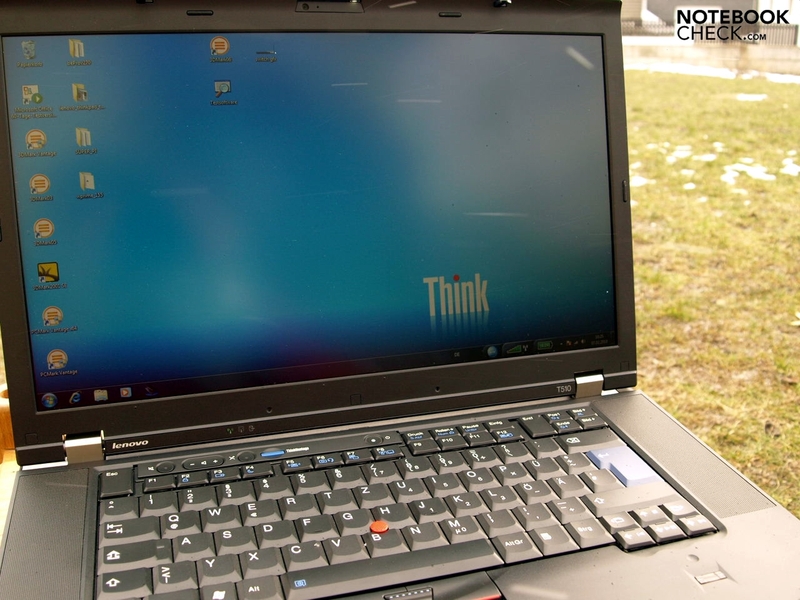 The Lenovo ThinkPad T510, in its tested configuration, can get quite warm under load. This applies especially to the bottom, which makes a use on the lap not very recommendable with a maximum of 49.3 degrees Celsius and a generally warmer fan area (over 40 degrees Celsius) in 3D-biased applications. The 40 degree mark is also surpassed in the central upper side area, that is exactly in the keyboard's center. In return, the touchpad and wrist-rest always stay sufficiently cool. If the impression has evolved that the device tends to overheat, we can give the all-clear. The inner component's temperature stayed within limits even after a 12 hour stress test. A 3DMark test executed immediately afterwards confirmed that there are only insignificant deviations in the result. In short: No throttling due to too low cooling performance! Besides, a perpetual full capacity use won't belong to the T510's conceived application field. The T510 stays pleasantly cool in use under low load. The upper side doesn't even heat up to body temperature after two hours of idle mode. We measured a maximum of 33.6 on the bottom and a maximum of 30.6 degrees Celsius on the top. (±) The maximum temperature on the upper side is 42.7 °C / 109 F, compared to the average of 33.9 °C / 93 F, ranging from 21.2 to 62.5 °C for the class Office. The loudspeakers are found at first sight. 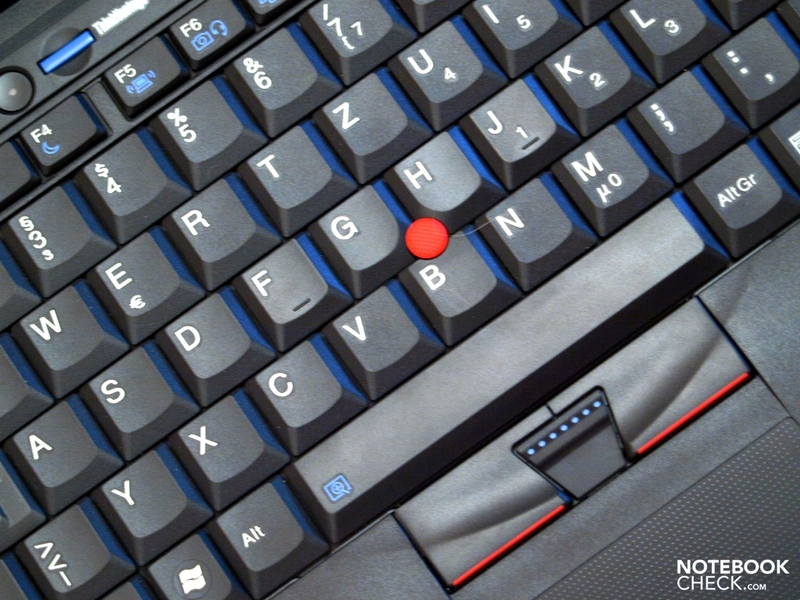 They have been placed on the keyboard's left and right side as in the ThinkPad T410. The sound is good for an office notebook, but isn't at all comparable with external sound systems. The maximum volume is sufficient for medium-sized rooms; the sound lacks bass, as is expected from devices without a subwoofer. Fortunately, the sound stays clean and undistorted at maximum volume. Due to the stronger 94 Wh lithium ion battery (11.1V, 8.4 Ah), the battery life turns out a lot better than in the T410 prototype with 57 Wh. BatteryEater's Classic test, with enabled wireless modules and maximum brightness, records a possible runtime of almost two hours in load operation. About twice as much could be counted with in practical use. 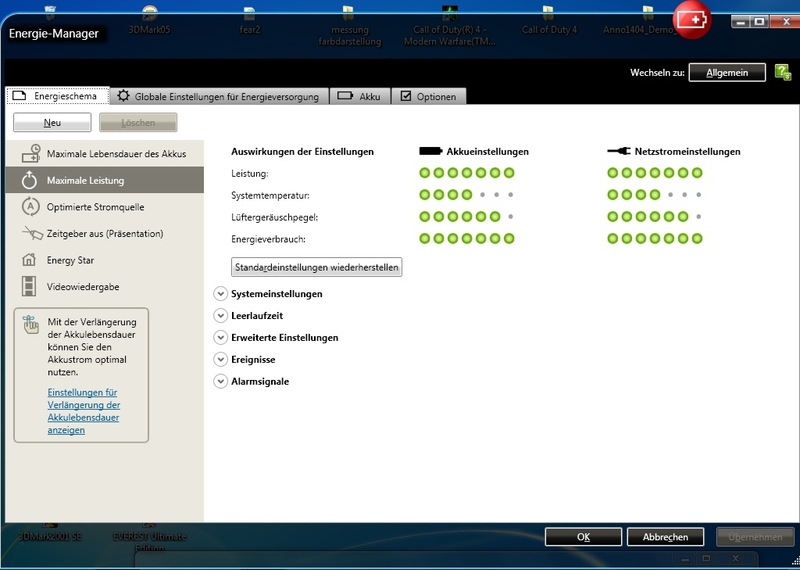 We researched in the internet for about four hours in the energy savings profile and brightness level 13/15 via WLAN. Furthermore, the battery life is sufficient for overlength movies in the "video playing" profile with about three hours. 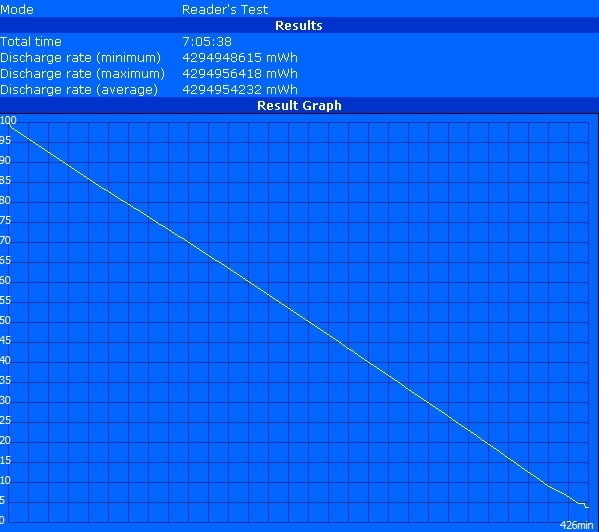 The BatteryEater Reader's test established a maximum runtime of about seven hours with disabled WiFi modules and minimum brightness, but a practical mobile working in this brightness setting isn't possible. As expected, the runtime gain approximately correlates to the capacity increase of 64%, in comparison to the T410's 6 cell battery. 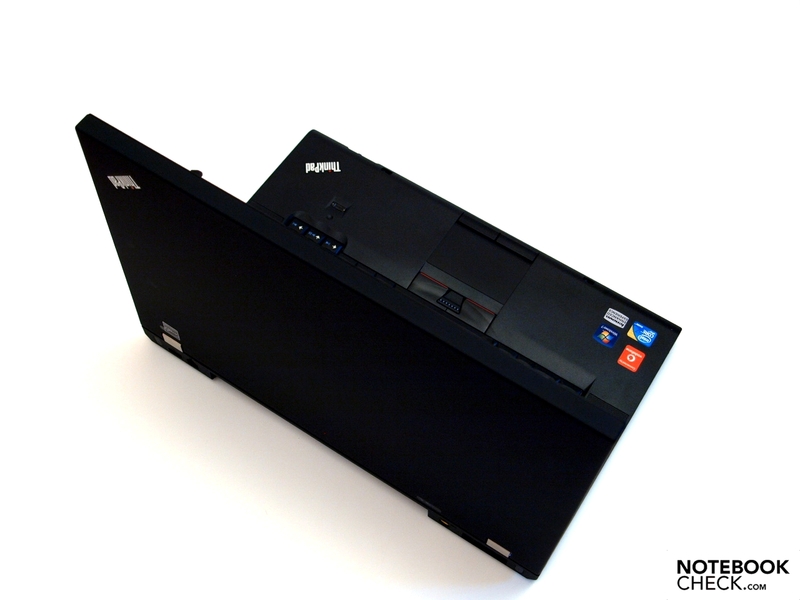 Thus, it can exceed the reviewed Dell Studio 1557 with a 56 Wh battery in all ratings. The minimum power consumption stays with 13 watts in an agreeably low field, despite strong components and can be ascribed especially to the Core i7-620M's energy savings functions, aside from the LED display. It can reduce the clock rate in low capacity, as well as disable whole cores quickly. The power consumption without load increases to 18.8 watts in a balanced energy profile. At maximum performance, and still without load, the whole thing increases to 24.4 watts. The power requirement reaches 47.3 watts under medium load in the high performance profile with all consumers enabled and the system ultimately treats itself to 69.7 watts under maximum load. So, it's on the same level as the smaller T410, except for slight deviations. 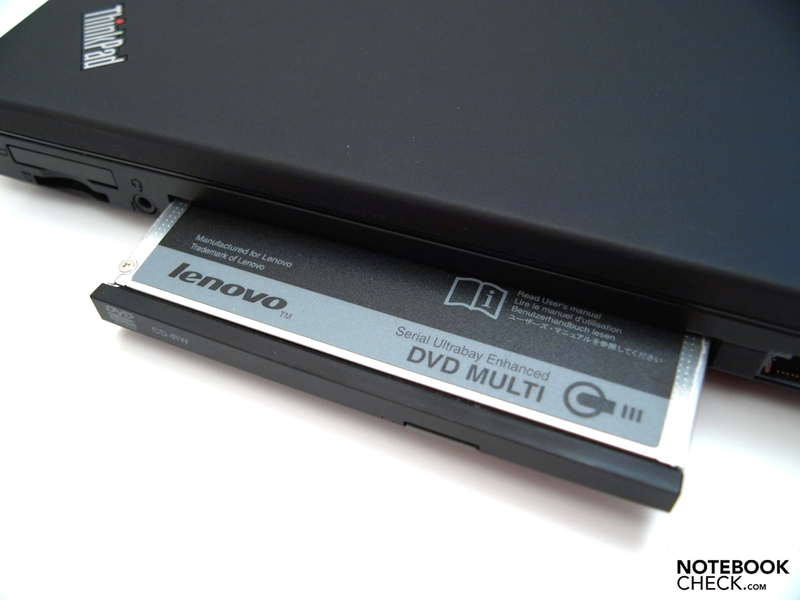 The same applies to the Lenovo T510 as for the recently reviewed T410 in terms of switchabilty - unfortunately, no. 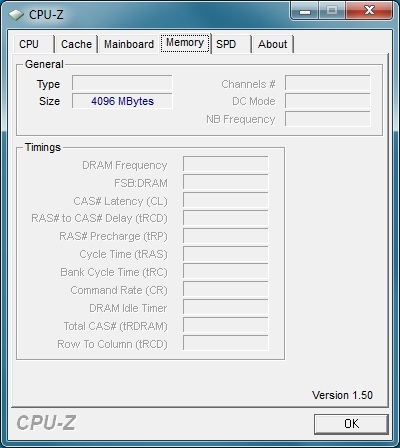 We also established here, after an alleged switching, that both the GPU-Z tool, as well as the EverestReport declare that the device has the same graphic card. Benchmarks and BatteryEater additionally confirm that a switching hadn't been executed. 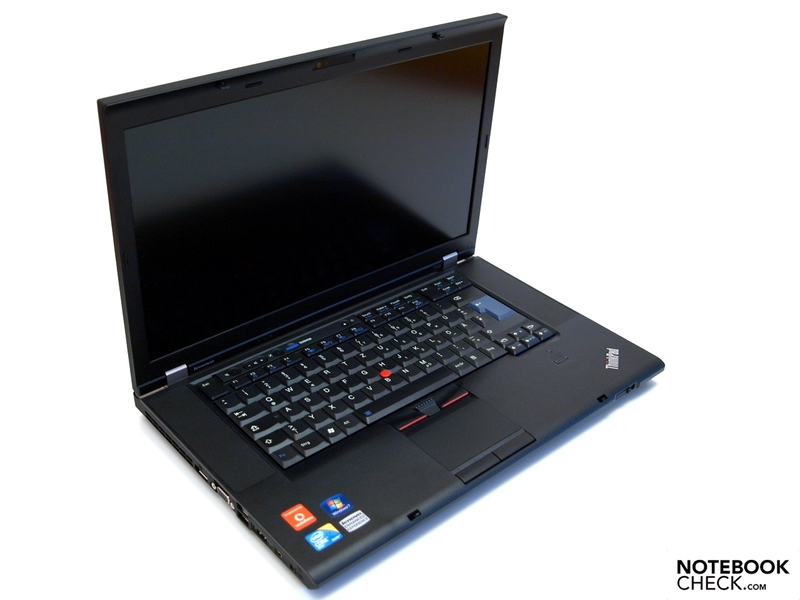 Basically, it can be said that the T510 series is an Arrandale upgrade of the T500 models. Whereas the T510 can score with a better CPU performance in and the T500 with a better graphic performance (application dependent). With the 9 cell battery, it also exceeds the battery life of the reviewed T410 and the T500, but only because of the larger battery capacity in the prototype. Unfortunately, switchable graphics, with which even more energy could have been saved in low operating load or in run of the mill office use, haven't been implemented into the T510 either. The input devices, especially the keyboard and the excellent trackpoint, are satisfying. The matt display is well suitable for a permanent use in the office or working outdoors. If need be, you can communicate via internet in areas with a poor infrastructure with the built-in communication modules Additionally, the 2.0 MP webcam allows video telephony via internet. The T510 can be connected to an existing work environment with a docking station, without further ado. The digital image interface directly on the case makes a good image quality on high resolution displays possible. Let's once again look at Dell's Studio 1557. Both are on the same level in terms of performance. This would also apply to the battery life if the T510 had been equipped with the 6 cell battery. However, the Dell laptop is aligned for the consumer market and should rather be seen as a starter multimedia device and entertainer at a low price. It's definitely not a device for a long-term work application with its glossy display. 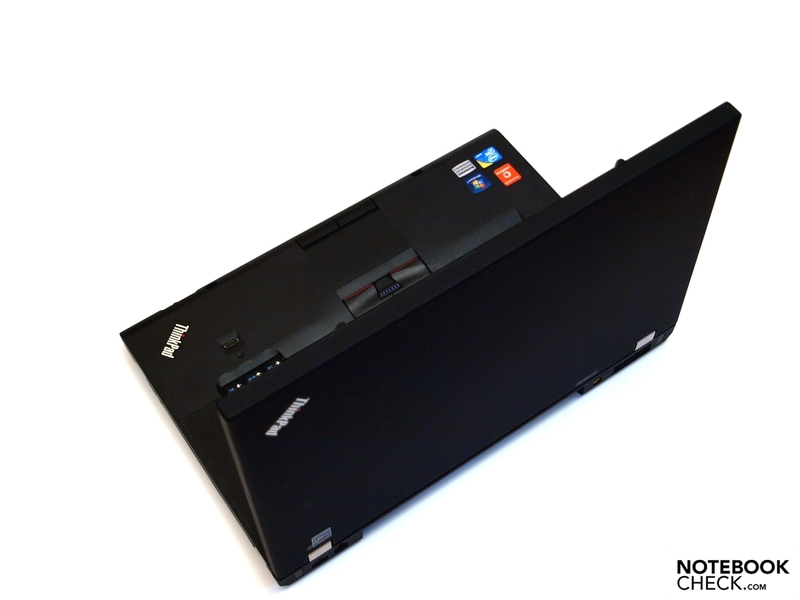 In return, the Lenovo T510 top model costs more than twice as much, depending on the factual configuration, but has business specific configuration features. A solid notebook that has been perfectly tailored to its designated application field and majorly continues the tried and tested ThinkPad tradition. 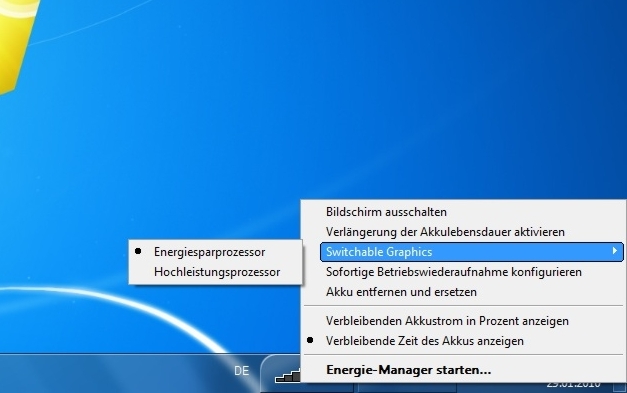 The switchable graphic that is supposed to be there according to various internet information and options in the energy manager, but actually hasn't been implemented. A device of this price category without feasible supplies, such as recovery DVDs, driver media, etc. 15 inchers with state-of-the-art hardware and business configuration.